I love free walking tours. Most major cities have them, and they’re awesome. 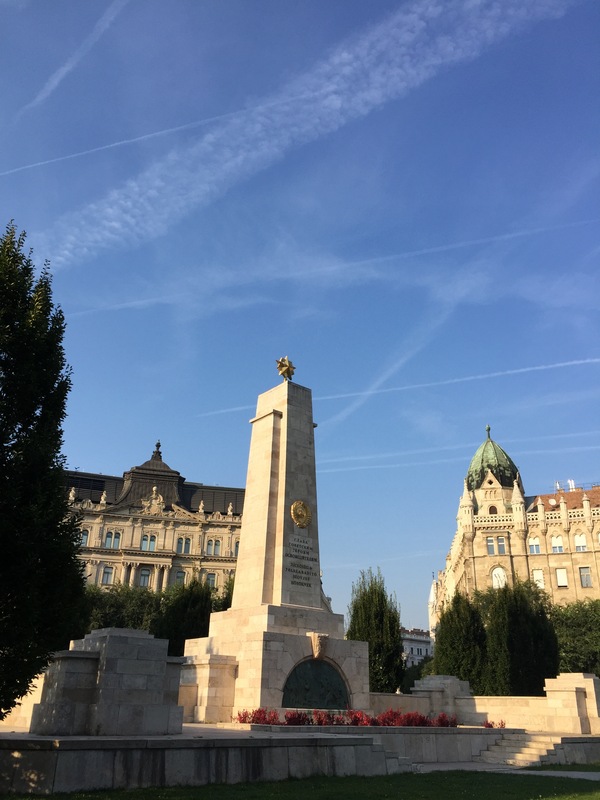 A day after the Merdeka (Malaysia’s 58th Independence Day, recently renamed “National Day” – don’t even get me started), Sue Huey and I went on two walking tours, a Budapest Free Walk at 10.30am and a Communism Walk at 3.30pm. For those of you who are unfamiliar with free walking tours, here’s a quick low-down: Your guides are not paid by any organisation or receive any funding from the state. Instead, they survive on tips. Those who attend these tours are encouraged to leave a tip according to how satisfied they are with the tour, and how much they can afford, obviously. Sue Huey dragged me along to the Communism Walk in baking heat of 36 degrees and boy am I glad I went. Having learnt almost nothing about communism from three chapters (if my memory serves me well) from our pitiful history classes and hearing of stories from our grandparents and parents about the Japanese occupation, I was well aware of my lack of knowledge about this topic. Unlike me, our guide, Anna, lived through communist Budapest till she was 10, when communism ended in 1989, which is fairly recent if you ask me. 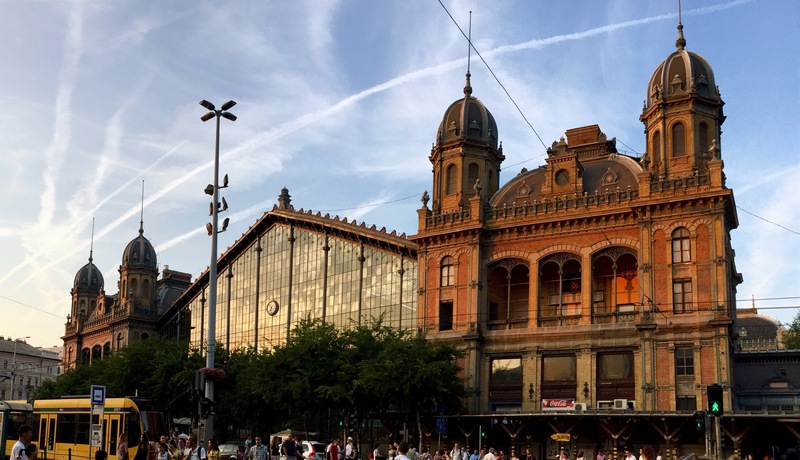 Although it didn’t look it from where we stood in Vörösmarty square, it became very apparent as soon as we boarded the train out of the city centre. From the walk, I learned three things about humans and our inability to avoid past mistakes. There is nothing new under the sun. What struck me most throughout the tour were the tactics used to scare people into obedience, isolate people from the outside world, propagandise and indoctrinate the young people; the mismanagement and misappropriation on state funds, inefficiencies of the state and the list continues. It seems to me these things happen in every country and across generations, regardless of the form it is embodied in, may it be capitalism or communism, socialism, facism, and any other -ism you can think of. Teenage boys and girls will be teenage boys and girls, regardless of where they come from or what language they speak. 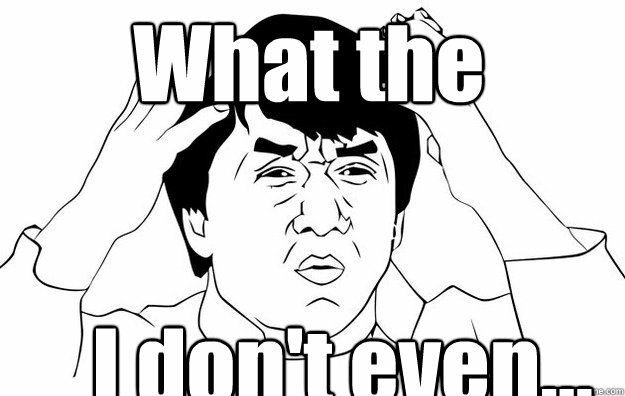 It is the crap that they pick up as they enter adulthood that truly ruins them. At the end of the walk, Anna showed us a picture of a a row of teenagers with shovels in their hands walking towards a day of hard labour with the widest smiles across their faces. Apparently, the lack of individual freedom in the city meant that teenagers didn’t get to hold hands or kiss or go on a *gasp* date. But chucking both boys and girls in a camp in the countryside (with a tonne of open space and almost no surveillance) to indoctrinate them over the summer, that just opened up a whole new world *ahem ahem*. People are willing to trade freedom for comfort. It wasn’t long before Moscow realised that they needed to treat Hungarians better to regain control of the country. This brought along Happy Communism, where there was guaranteed employment (leading to stable income without the need to save), free health care and education, free holidays (with your whole family) and good old communist entertainment like James Bond dubbed in Hungarian (and typical Russian villains were dubbed “Chinese Pirates” LOL). This also meant that people were happy to obey the authoritarian leadership, choosing to live a prescribed life instead of forging one for themselves so long as they were well fed and “happy”. The fall of communism in 1989 brought about democracy in the country. 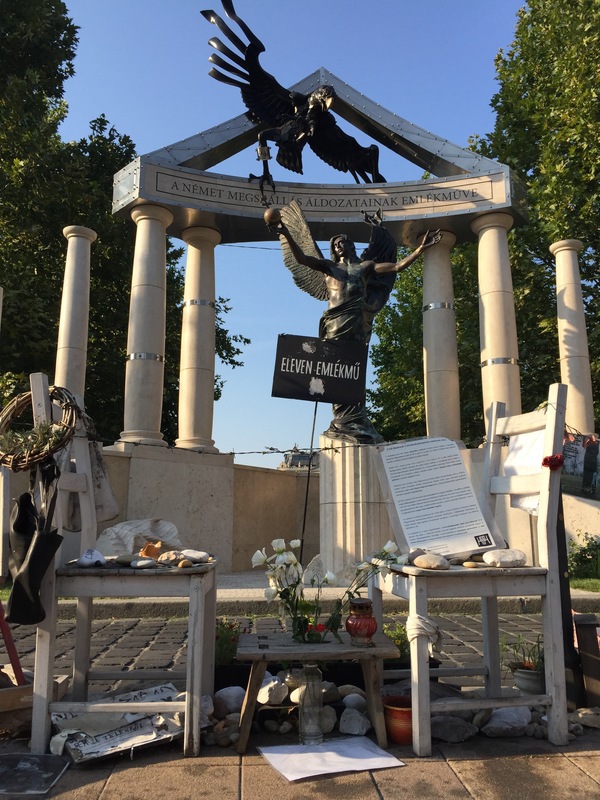 There were two spots in Budapest that, to me, perfectly demonstrates the way Hungarians have decided to remember their past and practice their freedom to speak and debate. 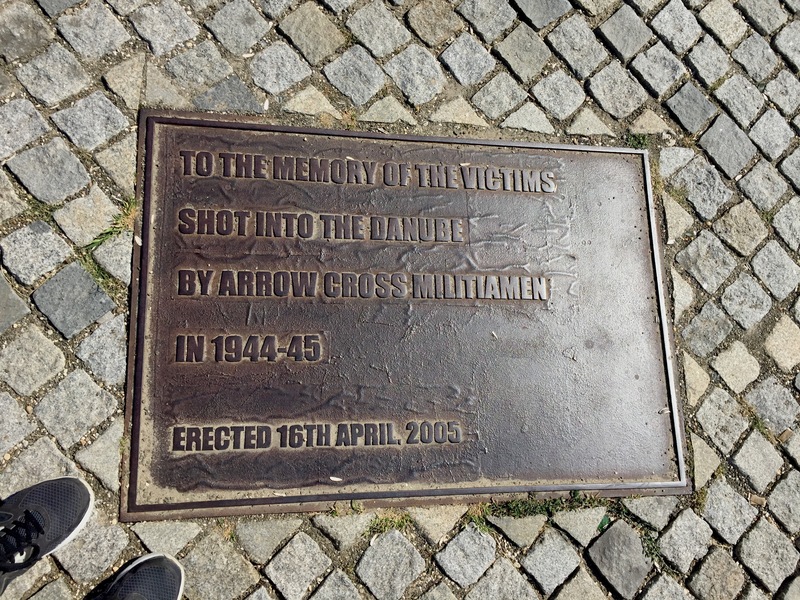 WW2 Memorial in Szabadság Square. Probably the most controversial memorial I’ve seen so far, it commemorates the Germans who took control of Hungary. Yup. The Nazis. In protest, regular people have stepped forward and laid out a whole row of pictures depicting loved ones they lost to the Nazis. Another mind-boggling memorial, the Soviet Monument in the freedom or Liberty Square commemorating Russia freeing Hungary from Germany… and imposing communism. . .
An incredibly meaningful exhibition brought to you by regular people like you and me. 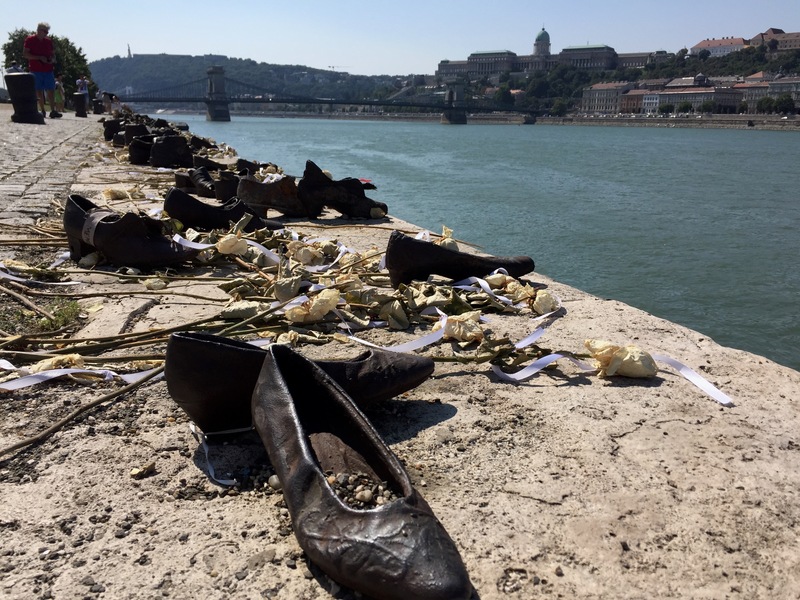 60 pairs of shoes laid out by the Danube River. The Nazis would bring people to this river, tell them to take off their shoes and walk across the solid icy river. Before they could cross, they would be shot at the back of their heads. Needless to say, my stay in Budapest was nothing but short and sweet. I learned so much in those few days and I have tremendous respect for the Hungarian people and all they have done to be where they are today. To some extent, I can also empathise with its current generation and the sacrifices they will have to make to overcome the gargantuan shadow cast by the mistakes of the past generations.